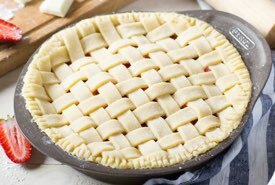 The traditional pie recipes featured below are rarely seen today. It's a mystery why, as these old fashioned dessert pies are so delicious. Surprise your friends with a "Mystery Pie," or maybe an Amber, Vinegar, Carrot, or Lumberjack Pie. Pick one and give yourself a special treat from Grandma's day. 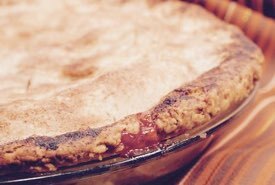 This old Southern pie recipe makes a great pie for taking on picnics, or for serving on any special occasion. Beat yolks of four eggs very light, with two heaping cups sugar, large spoonful melted butter, rounding teaspoon sifted flour, cup buttermilk, cup seeded raisins, teaspoon cinnamon, pinch each of cloves, allspice and nutmeg, two whites of egg beaten very stiff. Fresh fruits were only available in the late summer or fall in Grandma's day. So, preserves and dried fruits were often used to make pies at other times of the year. 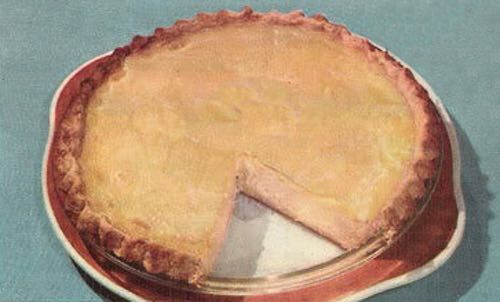 The "mystery pie" calls for jelly and jam, and its flavor was dependent on the available flavors of the preserves used. Serve the pie to your loved ones and have them guess its flavor. Beat separately very light, the yolks and whites of four eggs. Beat with the yolks a cup and a half of sugar, three heaping tablespoonfuls of butter, two teaspoonfuls mixed spices, either beaten or powdered fine, one cup of tart dark jelly, one cup blackberry jam, and one cup sweet milk. Add last of all the egg whites, mix in well, then pour in (two) pie pans lined with rich paste, and bake until firm. These traditional pie recipes call for ingredients not often associated with dessert pies today such as vinegar and carrots. That's right folks, vinegar and carrots! Our ancestors made clever use of whatever ingredients they had on hand, as stores were often distant and considered expensive. I believe that you'll be pleasantly surprised at the delicious taste of these old fashioned pies. One egg, 1 heaping tablespoon flour, 1 cup sugar, 1-1/2 tablespoons sharp vinegar, 1 cup cold water, nutmeg to taste. Beat the egg, flour, and sugar together. Add the vinegar and cold water. Flavor with nutmeg, and bake with 2 crusts (top and bottom). One cup cooked carrots (mashed), 1/2 cup sugar, 2 eggs, 1 pint sweet milk, 2 tablespoons molasses, 1 teaspoon cinnamon, 1/2 teaspoon ginger. Bake in one crust. Molasses is optional and may be omitted. Enjoy! 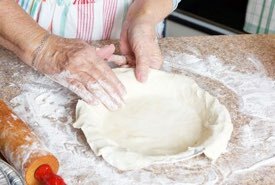 1 unbaked pie shell (8-inch). Cream together: 1/2 cup softened butter and 1-1/4 cups sugar. Add: 2 tablespoons vinegar (preservative), 1 teaspoon vanilla, and 3 eggs. Beat very well. Bake at 350°F for 45 minutes until a knife inserted in the center comes out clean. A lady named Sarah Austin used to serve this at the Kampus Kitchen in Edinburg, Texas. She passed this traditional pie recipe on to me when I got married, 36 years ago! 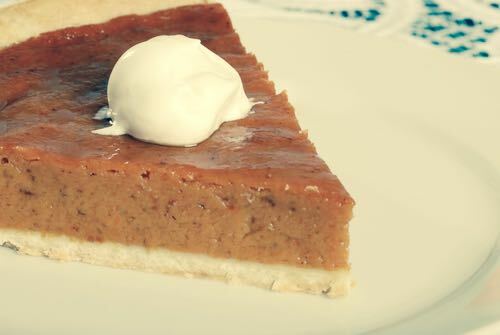 This pie tastes somewhat like Pecan Pie and can be served topped with whipped cream. Mix the eggs, sugar, beans, butter, and vanilla well together. Pour into an unbaked pie shell. Cover with the Grape Nuts cereal. Bake in a 400°F oven 30 to 45 minutes until the center has risen and no longer jiggles. 1. Turn on oven and set at hot (450°F). 2. Line 9-inch pie pan with unbaked pastry. 3. Mix together 1/2 cup sugar, 3 tablespoons cornstarch, and 3/4 teaspoon salt. 4. Add to mixture of 3 slightly beaten eggs, 2 teaspoons vanilla. 5. Mix well, then stir in mixture of 2 cups SEGO Evaporated Milk and 2 cups boiling water. 6. Pour into pastry-lined pan and bake 20 minutes. 7. Reduce heat to slow (325°F) and bake until knife inserted near outer edge comes out clean or about 20 minutes.